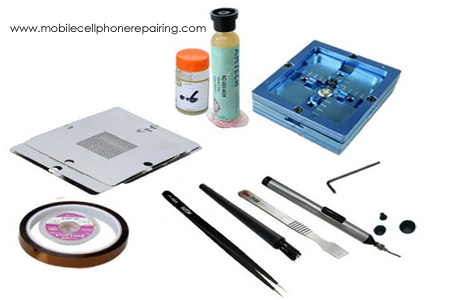 BGA Reballing Kit for Mobile Phone Repairing – These BGA Kits are needed to repair BGA IC on PCB of a Mobile Phone. Learn all about BGA Reballing Kit. BGA Kit or BGA Reballing Kit is used for reballing the solder balls of a BGA IC (Ball Grid Array). 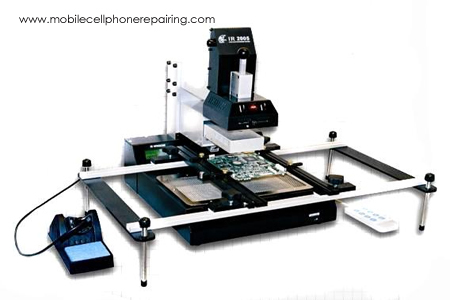 There are several BGA Reballing kit and BGA rework stations available in the market. Most repairing professionals generally start with a starter BGA Reballing kit and gradually shift to latest universal kits and stations. Heat Resistant Kapton Tape or Clips to hold the BGA IC to the Stencil. SMD Rework Station and Soldering Iron are generally NOT a part of the Kit. Desolder and remove the BGA IC from the PCB. Now clean the solder from the bottom of the IC and the PCB where the IC was soldered. Use a soldering iron and desoldering wire or wick. Now select the right size of the IC depending on the number of balls from the stencil supplied with the kit. Place the IC on the stencil and tightly hold it with the stencil using clip or tape. Now apply solder paste from the other side of the stencil. Solder paste will stick to the IC through the tiny holes in the stencil. Now apply hot air using SMD rework station. This will solidify the solder paste and it will form solder balls that will stick to the IC. Now clean the IC with Acetone or IPA solution and remove it from the stencil. Now the BGA is ready to solder back to the PCB. This is done by placing the IC on the PCB and applying heat. l am a myanmar so english writing is very poor but l am understanding with mobile reparing.Thanks. Thanks alot sir for the update. May God grant more knowledge.